After experimenting with the Simple 3-Cheese Crock Pot Pasta and discovering that we can dump uncooked pasta into a crock pot, then walk away and come back to a finished meal a few hours later, I’ve been on a mission to see what other varieties of pasta our crock pots can cook for us. Person: What do you do all day? You and Me: I spend a lot of time not cooking pasta. We can expand the conversation by explaining that we also spend a lot of our time not thawing meat, and an additional portion of our day not soaking beans. We have become experts at all the kitchen tasks we don’t do while still managing to put amazing, real food meals on the table. This Simple Meals life is beautiful, isn’t it?! 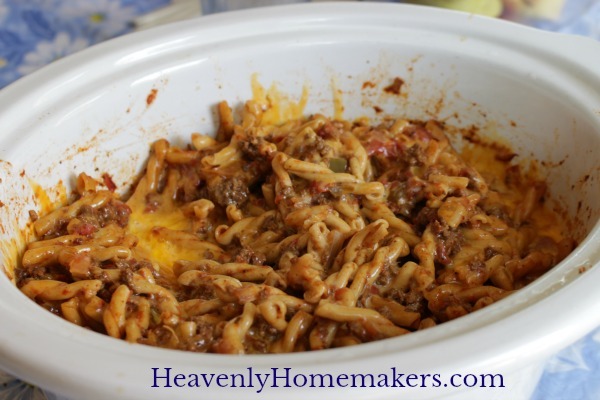 The Simple 3-Cheese Crock Pot Pasta really saved my neck one day recently when I had only three hours to make a meal for a table full of last minute company. I grabbed a package of pasta and two jars of sauce from my pantry, dumped it all in the crock pot and did not go back into the kitchen until time to serve the cooked meal along with some fresh fruit and fresh greens from our garden. 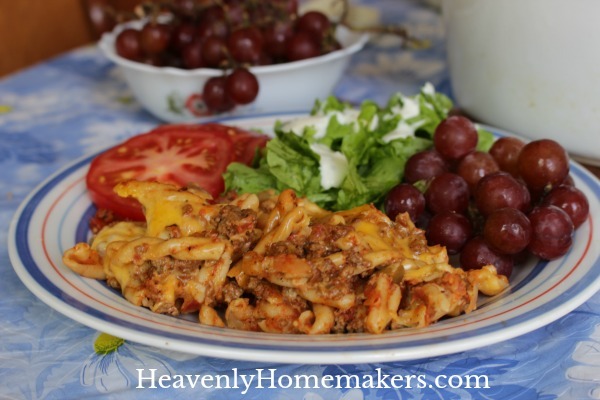 The Simple Crock Pot Pizza Casserole would have worked just as nicely. 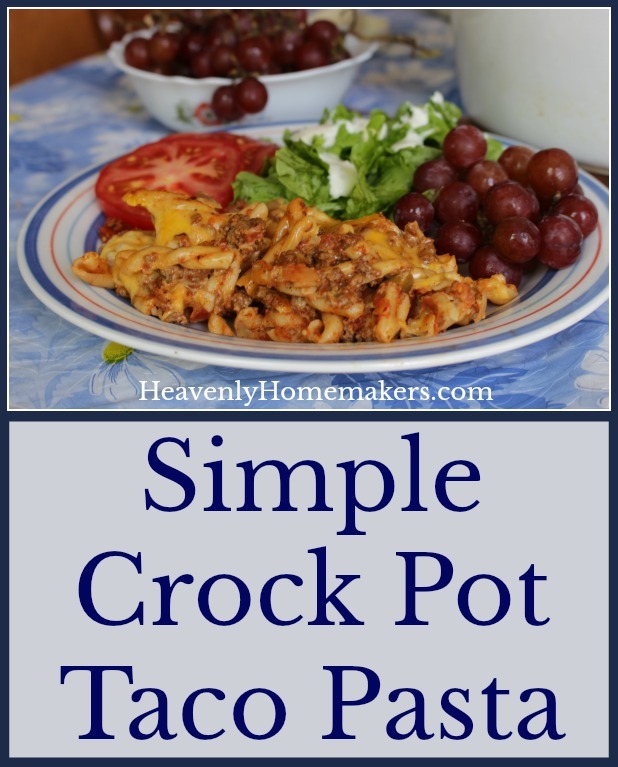 And today I will show you how to turn this Simple Skillet Taco Pasta recipe into an effortless crock pot recipe. The first time I made this was a day I had to have one kid out the door by 8:00, another kid and my husband out the door by 8:50, myself out the door by 10:00, and lunch on the table for my entire family plus a house guest by 12:30. I had some leftover taco meat in the fridge, so I dumped it into the crock pot with a package of dry pasta, stirred in two jars of salsa, and added some water. I sprinkled in some sea salt and left the house. When I came home at 12:15, I stirred the delicious smelling meal, spread on some shredded cheese, and let the food sit while I got out grapes and salad. Lunch was served within minutes of me not being home to cook. I am so grateful for recipes like this! Stir all ingredients into a crock pot. Top with cheese and let sit for 5-10 minutes or until cheese is melted. Obviously it helps to make this recipe easier if you have some leftover meat all cooked and ready to go. I love using seasoned hamburger meat, but leftover Shredded Ranch Chicken would work great too. Any time I’m making seasoned meat, I always make extra so I can use leftovers in salads or meals like this! Do you have any other great ideas for me as for sauces to cook pasta in the crock pot? Psst! 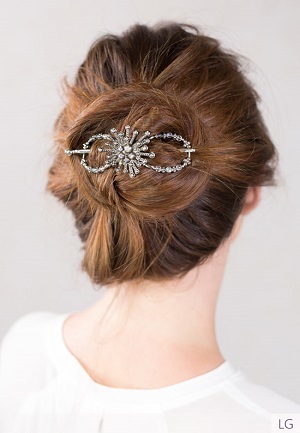 Lilla Rose Sale is having a sale right now! Get ready to celebrate the 4th of July in style, with the gorgeous new “Fireworks” Flexi in two colors, and five re-released past popular Patriotic clips. They are all so pretty and sparkly, and also now on sale at 10% off! In addition, select styles are also on sale at 20-30% off! Sale starts Friday, June 16 at 7 a.m. PST at midnight on Sunday, June 18. “I just spent two hours at the trampoline park with my son. Look what held my hair comfortably and securely all afternoon! Thanks, Paula, for offering–and teaching us how to use–flexis!” -Aimee L.
“I teach fitness classes, and it’s the best thing ever to hold up all my hair! LOVE them!” – Rosemary M.
Despite my best attempts to use pasta in the crock pot, I seem to fail every time. Either overcooked, or undercooked, and never, ever just right. :-( I’m also surprised the ‘slap together and leave it’ approach worked. In my experience, I have to stir every once in a while to prevent burning and to ensure the liquid distributes. What is this mama doing wrong? I want to slap together and go run errands, but it’s not working! I am soooooooooooo open to suggestions. Many thanks and this looks easy and yummy!!! Hmmm, I’m not sure! It’s always worked well for me – though the “finished and ready to eat” time is a little bit tough to assign specifically since crock pots are all a little bit different! I find that if I put in dry pasta with the sauce to save time and cook the pasta in the crock pot, it gets really mushy and I don’t like the texture (my family doesn’t seem to mind). BUT if I boil the pasta and cook it first then put it in the crock pot with everything else it doesn’t get any mushier during a 2-3 hour cook time on low and turns out fine. Strange! Karen–I do sometimes have burning around the edges, depending on how long I leave things in, but it isn’t enough to hurt the overall dish.